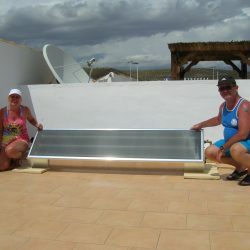 We recently moved from camposol to bolnuevo, while we were living in camposol we had solar hot water installed, we were very impressed with Martin and his team, very professional, courteous and cleaned up afterwards. We were so happy with the system that when we moved we had Martin to install a similar system at the new house, it is efficient and economical, saves money on electricity. We also had a pellet burner installed in the new house, we are absolutely over the moon with it ,our house is so warm and it’s stunning to look at , it fits in perfectly with our decor, it’s so easy to operate and takes a couple of minutes to clean out , thankyou Martin and your team. Bernie and I recently decided to have Pool Heating installed and after doing our research plumped for Free-Sol to complete the work. Martin provided us with a detailed brief on the work to be carried out and also advised us very honestly on the best installation to meet our needs. We had the solar panels placed on our flat roof and the pump and electrical box located discretely in a corner of the garden. The attention to detail by Martin and Tom, who completed most of the work, has been excellent and extremely professional. Their explanation as to how the system works was easy to understand and the after sales service second to none. Claire who runs the office is always available to talk to and will arrange for Martin or one of the other guys to visit if you have a problem. We are very happy to say that since installing the system in October 2018, no malfunctions have taken place. In our opinion anyone considering Solar installation should contact Free-Sol for a quote and advice. We have been delighted with their professionalism and ease in which they deal with their customers. It has been so nice in this day and age to meet an honest and likeable Company of people. I am more than satisfied with the service and product provided by Free-Sol. The solar system was installed with little disruption and is performing even better than expected. I would have no hesitation recommending this company and the product. Just like to say many thanks again for all your hard work and to the guys who worked really hard to get finished within the day everyone is impressed with the system that we have shown it too.